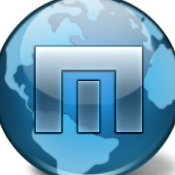 I should have really mentioned this when it first started happening, but for all releases over the past couple of months I've found Maxthon slow to a near-freeze whenever I've left my computer idle for more than about 10 minutes. Has anyone else experienced anything alike? I'm updated to 5.2.4.600 at the moment and it's already happened to me twice today. The number of tabs open appears to have no effect on whether it happens or not, nor is there any other identifiable reason to be found. No consistency in what pages or websites I may have open, nor any with a heavy load that I could imagine either Maxthon or my computer struggling with. Nor do I have any other processes running that would be hogging either processor or memory. Typical scenario: I'm working away for hours perfectly happily, opening and closing tabs, browsing, working. I leave my desk for lunch: it doesn't lock, it doesn't sleep or anything else; it doesn't even necessarily time out to turning off my monitors. When I return, Maxthon - and only Maxthon - is suddenly sluggish, and does that window-render-crash thing, where the height of the (maximised) browser window stretches down to cover up the taskbar, blurring the active tab's contents in the process, if I attempt to do anything, whether that be in the active tab or switching tab. It isn't a complete crash but very, very slow. Whilst the speed does appear to improve a little (over a matter of minutes) if left to its own devices, invariably the only actual solution is to quit Maxthon (sometimes forcefully) and start it up afresh. I'm running Windows 10 Pro x64 with 32 GB RAM on i7-5820K @ 3.30 GHz. As I type this, the utilisation is 3% CPU and 27% RAM - very typical. My Maxthon 5.2.4.600 has been open since 4:30 A.M. and it is now 7:16 P.M. and has not experienced anything you are seeing. Windows 10 x64 Insider Edition 17713.1000. Did you do a clean install or install over an existing version? I've had mine open for days... no issue. Doesn't help with the issue though, just shows that's it's not directly a maxthon issue. More than likely an extension or some site doing something odd that MX doesn't like. Not sure - likely over a previous version, but at least one of them may well have been clean. I will install today's clean in a moment. The only consistent website would be Google Inbox - oh, and mx://last-visit/.